Early in 1997 – long before the term learning management system (LMS) was coined – a group of RVC faculty members led by Professor Fred Siewers (geology) began a grassroots effort to bring an online computer conferencing system to RVC. The purpose of this educational network (named EdNet by Dr. Siewers) was to provide online discussion forums related to each class. The team submitted a proposal requesting seed money to begin the project. With support from Dr. Mike Bequette, Dean of LAS, EdNet was approved by RVC’s President, Dr. Karl Jacobs. Using spare parts donated by RVC-IT and a few purchased components, Professor Tom Lombardo built the first EdNet server, which was housed in an empty office in the WTC. On a snowy November Saturday in 1997, about 30 innovative RVC faculty members attended a training session to learn how to use EdNet in their classes. EdNet went live for classes in January of 1998, and served as a “classroom away from the classroom” for many years. As RVC entered the distance learning realm, EdNet became the delivery medium for online and hybrid classes, as well as serving its original purpose of supplementing traditional classes. EdNet grew over the years until the software could no longer keep up with RVC’s needs. In 2010 EdNet was replaced by EAGLE. Terry Frers wanted to improve his own future while also being a role model for his kids. That’s why he enrolled in RVC’s GED program with his daughter, Terri, and son, Christopher. All three had dropped out of high school in their junior years, but together they graduated from RVC’s GED program on June 5, 1997. The family attended GED classes after work each day and helped each other study for exams. “I could have taken the GED test orally, but I decided to do it with my children to show them I could do it,” said Frer. 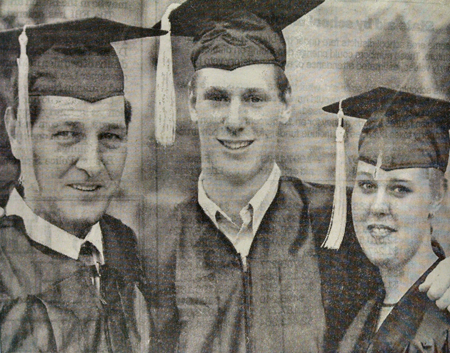 Terry Frers with his son, Christopher, and daughter, Terri, at RVC’s GED Graduation in 1997. 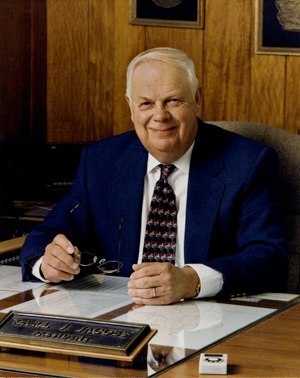 After serving as Rock Valley College president since 1969, Dr. Karl J. Jacobs officially concluded his nearly 29-year run as president on September 30, 1997. Jacobs had announced his retirement in 1996. During his tenure, multiple academic programs and building projects were formed to serve the region. Highly respected by local leaders, Dr. Jacobs continually sought to meet community needs through academic and career programs at Rock Valley College. 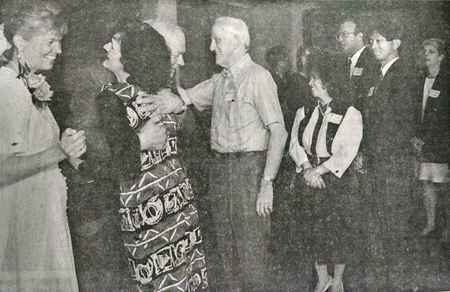 When the college opened in 1965, there were 35 faculty members, a few part-time lecturers, and 1,100 students. At the time of Dr. Jacobs’ departure in 1997, RVC had grown to 140 faculty members, 500 part-time lecturers, and 13,000 enrolled students. Years later, to ensure his name would remain a part of RVC for years to come, the Karl J. Jacobs Center for Science and Math was named in his honor in 2009 with the building officially opening for classes in August 2011. Over 400 people turned out at Forest Hills Country Club on July 25, 1997, to bid farewell to Dr. Karl Jacobs. Jacobs would officially step down as RVC president on September 30, 1997. On June 16, 1997, Roland J. Chapdelaine was named the third president of Rock Valley College. 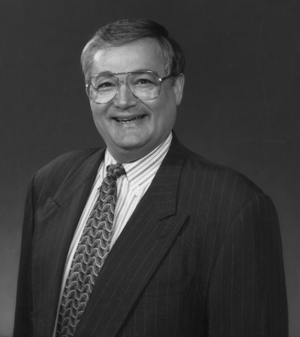 Chapdelaine came to RVC from Cumberland County College in Vineland, New Jersey, where he had served as president since 1989. Upon his hiring at RVC, Chapdelaine stated, “I’m looking forward to working with the college and taking it to the next phase of evolution.” Chapdelaine officially began his duties as RVC president on October 1, 1997. 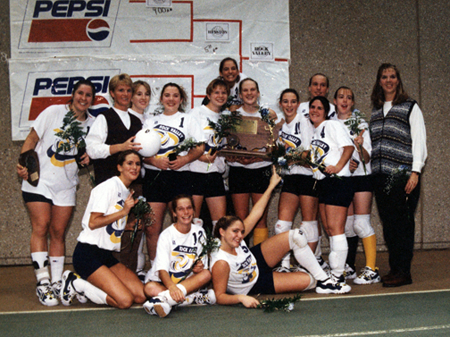 After winning the first NJCAA championship in RVC history in 1996, what could the Golden Eagles volleyball team do for an encore? Behind All-Americans Tandy Johnson, Rachel Schrader, and Kara Smith, Heidi Hutchison’s team overwhelmed Hesston College (Kansas) in three games to capture the NJCAA Division III volleyball national championship for a second straight season on November 15, 1997. Tandy Johnson was named the NJCAA tournament MVP for the second year in a row. After sharing National Coach of the Year honors in 1996, Hutchison would this time win the award outright. Less than two years later, Hutchison would pass away in October of 1999 after a long battle with cancer. To honor her legacy, the NJCAA Division III Volleyball Coach of the Year Award was renamed in her honor beginning in 1999. In 2009 she was elected to the NJCAA Region IV Hall of Fame by a vote of region athletic directors, and in 2013 she was inducted into the RVC Athletics Hall of Fame as part of its inaugural class. 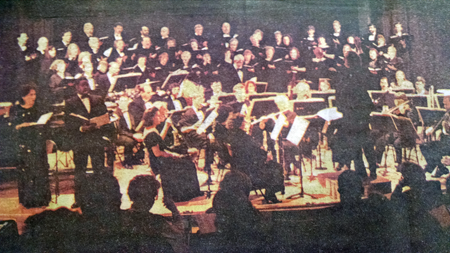 The Rock Valley College Community Chorale celebrated its 20th anniversary in 1997. The then 60-member chorale was founded in 1977 by conductor Andy Koebler. Koebler returned from Virginia to lead the chorale’s first two concerts of the season on November 22-23, 1997.